Kromeriz ( German: , Polish: ) is a Moravian town in the Zlin Region of the Czech Republic. The towns main landmark is the Baroque Kromeriz Bishops Palace, where some scenes from Amadeus and Immortal Beloved were filmed. The Palace and the Flower Garden in Kromeriz were added to the list of World Heritage Sites in 1998. The citys National Museum is home to The Flaying of Marsyas, a late painting by Titian. The town, inhabited by slavs from the 7th century, was founded in 1260 by Bruno von Schauenburg , bishop of Olomouc. 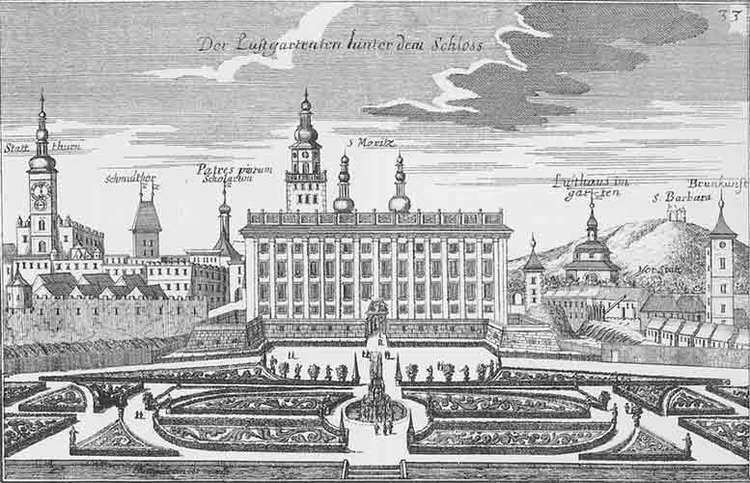 Bruno chose Kromeriz to become his see and he also made his castle the centre of his dominion which consisted of more than 60 vassals from the whole of Moravia. Kromeriz is referred to as a market village in a document by Premysl Otakar II from 1256, but in 1266 it is already called a town. Bruno also established what was to become the famous Archbishops Palace. The town was badly damaged in the Thirty Years War, was plundered twice by Swedish troops (1643 and 1645), after this the Black Death came. Bishop Karl II von Liechtenstein-Kastelkorn rebuilt the city and the palace after the war. The Constitutive Imperial Congress sat in Kromeriz in 1848.